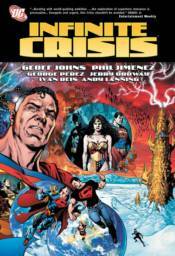 Written by Geoff Johns Art by Phil Jimenez, George P�rez, Jerry Ordway, Ivan Reis, Andy Lanning and others Cover by Jimenez The 7-issue miniseries event that rocked the entire DC Universe in 2005-2006 - a sequel to the epic CRISIS ON INFINITE EARTHS - is now available in an amazing softcover collection! OMAC robots are rampaging, magic is dying, villains are uniting, and a war is raging in space. And in the middle of it all, a critical moment has divided Earth's three greatest heroes: Superman, Batman and Wonder Woman. It's the DCU's darkest day, and long-lost heroes from the past have returned to make things right in the universe...at any cost. Heroes will live, heroes will die, and the DCU will never be the same again! This exhaustive volume contains every cover and variant produced for the project, annotations, character designs, excerpts from scripts, unused scenes, and much more!